toonel.net: what is it good for? Why toonel.net is different? 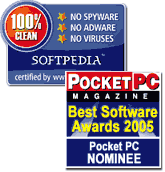 02-aug-2006 Toonel.net for Pocket PC has been nominated for a 2006 Best Software Award in the "Browsers and Web Utilities" category by the Smartphone & Pocket PC magazine staff and its Board of Experts! 17-jul-2006 SOCKS4/5 support added (limited) to .NET version of Toonel for Windows Mobile (Pocket PC only). 24-jun-2006 .NET version of Toonel for Windows Mobile (Pocket PC only) is available for downloading. 03-jan-2006 version 0.0.50.50 is available. Latest version provides greater compression ratios, allows to control quality of GIF images and use of parent proxy servers. Added extra settings to improve memory usage on limited mobile devices such as P800. 28-nov-2005 toonel.net client version 0.0.50.45 (Generic and Symbian) is available. Client allows to control quality of JPEG images. Fixed throughput issues on mobile devices. According to www.dslreports.com the maximum P800's throughput is 180 kbs. 15-jul-2005 toonel.net version 0.0.50.26 for Windows Mobile is now available. 24-apr-2005 toonel.net version 0.0.50.20; added SSL support for POP, SMTP and IMAP connections. This option is especially useful on mobile devices (SE P800, SE P900, SE P910, Zaurus etc) for receiving emails from SSL-aware servers like gmail.com . Check our support page on how to configure email on SonyEricson P800. 30-mar-2005 toonel.net version 0.0.50.10 for mac os x; version history section is now available. 05-mar-2005 toonel.net version 0.0.50.05 with enhanced user interface is available (generic and mac os x packages). 17-feb-2005 we finally made our first freeware package for the macintosh platform available on www.versiontracker.com. We've been using this for almost a year and we hope that someone else might also find this service useful.